Rub curry powder on chicken. Cut chicken into 3/4-inch pieces. Let stand 10 minutes. Spray wok or 12-inch skillet with nonstick cooking spray; heat over medium-high heat until cooking spray starts to bubble. Add chicken; stir-fry 2 minutes. Move chicken to side of wok. Add oil to center of wok. 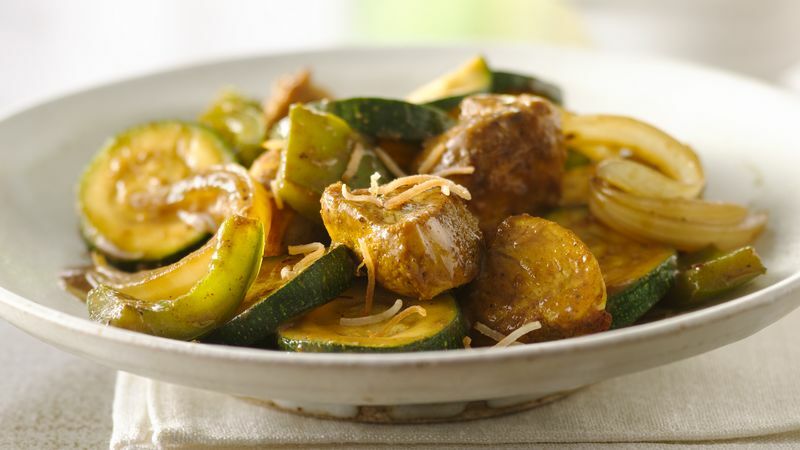 Add onion, zucchini and bell pepper; stir-fry 2 minutes. Add coconut milk, bean sauce, gingerroot and salt; cook and stir until sauce coats vegetables and chicken and is heated through. Sprinkle with toasted coconut. Toasted coconut adds an exotic tropical flavor, but just 2 tablespoons contain 4 grams of fat. By limiting the amount of coconut you use and buying reduced-fat coconut milk, you can still enjoy the taste without excess fat and calories.